In Part One we met Ciara and Michael who were getting married in front of 100 of their closest family and friends at a wedding venue for their Nerja Wedding. Today we get to share all the wedding day details with you. With over 100 guests all staying within Nerja, we arranged two coaches to take everyone to the venue. Two of the guests happened to be a couple whose wedding Scott had arranged five years earlier. They are friends of Ciara and Michael and it was lovely to catch up with them. 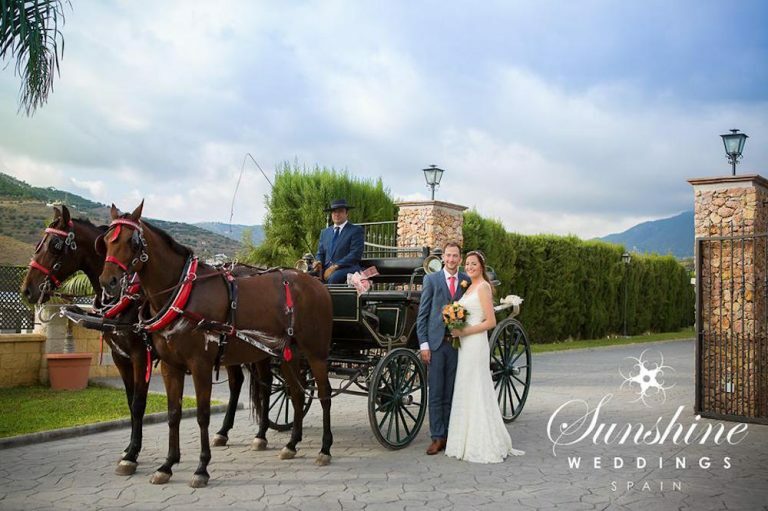 We love happy coincidences at Sunshine Weddings Spain! The ceremony took place at a spot overlooking the sea and was led by Padre Peter, much to the delight of the guests. One guest was overheard saying, “It’s like being on the set of Monty Python.” Padre Peter flawlessly mixed tradition and humour throughout, which perfectly fitted with the wedding day vibe. After the service guests were taken to a private area of the venue for cocktail hour, while Ciara and Michael dashed off to take some photos. Wine, cava and a selection of canapés kept the guests happy until it was time for the wedding breakfast. Breaking up the event by offering your guests something as soon as the ceremony is over, whether it’s a drink or a sweet treat, instantly makes them feel relaxed and well looked after, while also giving them the opportunity to chat and mingle. For the reception dinner, the focus was for the food to be really fresh, seasonal, and delicious. We kicked off with Mushroom and Grilled Prawn Risotto. This was followed by a choice of Sea Bass or Sirloin Steak, while the finale was a mouth-watering White Chocolate and Mango Heart. The entertainment helped get everyone in the mood to party. It started off with Monkey Tennis, who played everything from Paul Weller to Stevie Wonder and Coldplay to Pink Floyd. Then we cranked it up a notch with DJ Si and this is when everything went a little crazy on the dance floor. The following day we organised a get together for everyone inside Nerja itself. The aim was to create a vibe that was social, fun, and laid back, the perfect come down after the wedding day. Ciara and Michael wanted a party that felt more like a coming together of old friends than a formal event, which we think we definitely pulled off. We wish them all the happiness in the world and thank them for letting Sunshine Weddings Spain be a part of their wedding.